You don’t have to live in D.C. to be a part of the Washington Metro. There are plenty of towns and communities in both Maryland and Virginia full of people who work and play in the District of Columbia, and some people would say that even Baltimore is in the national capital’s orbit. Kemp Mill is even more of a suburb than many of the communities around it. Houses, churches, and synagogues take up most of the local real estate, along with a few schools and a shopping center. However, there is one thing that makes Kemp Mill similar to its neighboring communities: it experiences the same wet springs and humid summers as the rest of D.C. and east Maryland. As a result, mold can become a real problem in basements and crawlspaces throughout the neighborhood. That’s why AA Action Waterproofing provides mold remediation for Kemp Mill, D.C., Baltimore, and even neighboring states like Delaware and Pennsylvania. 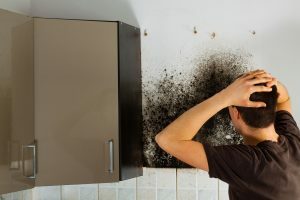 Mold is a kind of microscopic fungus which includes thousands of species and can grow on just about any surface where it can get a decent perch. Mold is the reason why food goes bad after a while so long as it’s exposed to air and contains any amount of moisture, and it’s what gives bleu cheese its unique flavor. Not every kind of mold survives on food, though. Many species can consume wood or the organic fibers in cloth and carpets, and some can get along just fine by eating the organic debris in dust. Mold spores are everywhere, and all they need to start growing is a little moisture, the right kind of nutrients, and some peace and quiet. A mold outbreak can cause some problems for a few different reasons. First, spores of the several species known as black mold are mildly toxic in humans, and with enough of them in the air you’ll feel like you have a miserable cold so long as you’re at home. Second, mold can infiltrate wooden beams and other structural materials, weakening them and making the mold outbreak much worse than how it looks on the surface. AA Action Waterproofing can perform mold remediation in Kemp Mill to remove excess moisture in basements and crawlspaces and reduce the mold spore count to normal levels. No one can drop the spore count down to zero, which is why we in the business call it remediation instead of extermination, but fortunately the spores are only a problem when the number gets excessively high. The reason you should look for a waterproofing service for mold remediation in Kemp Mill and anywhere else in the United States is because it’s so essential to get rid of any leaks, water infiltration, and excess humidity. Every living creature requires at least some water to survive, but mold is particularly tenacious. So long as water is getting into your crawlspace or basement, another mold outbreak is sure to come. The solutions are as different as the causes. You can fix too much humidity with a dehumidifier, and a leaky pipe just needs tighter bolts or a relatively easy replacement. If condensation on cold pipes is leading to mold growth, we can add insulation to keep things dry and possibly save you a little money on your energy bill. If a clogged gutter is letting too much rainwater drip into the foundation, it’s simple enough to clean or replace them, and while a high water table can leak in through a cracked foundation, you can keep it at bay by installing a sump pump. Once the waterproofing is complete, the next step of mold remediation in Kemp Mill is to block off all the vents, doors, and windows in the affected area and get to work cleaning. For many homes this cleaning is simply a matter of using industrial-strength chemicals on mold-covered surfaces, but if the mold outbreak is particularly bad we may have to remove and replace drywall panels, insulation, and wooden beams. If you need mold remediation in Kemp Mill, the D.C.-Baltimore Metro Area, or beyond, you should contact AA Action Waterproofing. The first inspection is free, and you’ll get our initial estimate in writing. We’ve been in business for just around 30 years now, and in all that time we’ve never seen a mold outbreak we couldn’t handle.